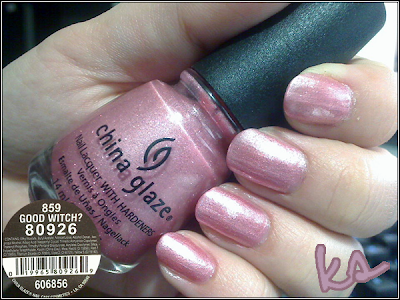 China Glaze Good Witch? was apart of the Wizard of Ooh Ahz Returns! collection that appeared at the end of this year. The original collection came out in 2001, back when I kept my nails bare (gasp!). Good Witch? is a pale pink frost with a very fine pink microglitter. It almost dries matte and a tad gritty, but a top coat of Seche Vite smoothed it out. I was a little irritated in the sheerness though - one coat of base coat and FOUR coats of polish before my VNS was mostly gone. I think this color blends a little too much into my skin color, but it's still a pretty polish. is this the same as the one on your header? Very pretty! Nope, the header is actually Rose Tea :) I'm going to have to swatch that soon, because it's a beautiful color to wear. Thank you for commenting!